Most of us have already got the Christmas tree up and have the twinkly lights brightening our evenings but to have a seriously cosy Christmas you are going to need a few extras. Starting with the sofa , get this wrong and you will be watching the Queens speech is more discomfort than normal. You need to be looking for a warm hard wearing sofa like the Ashridge pictured above. 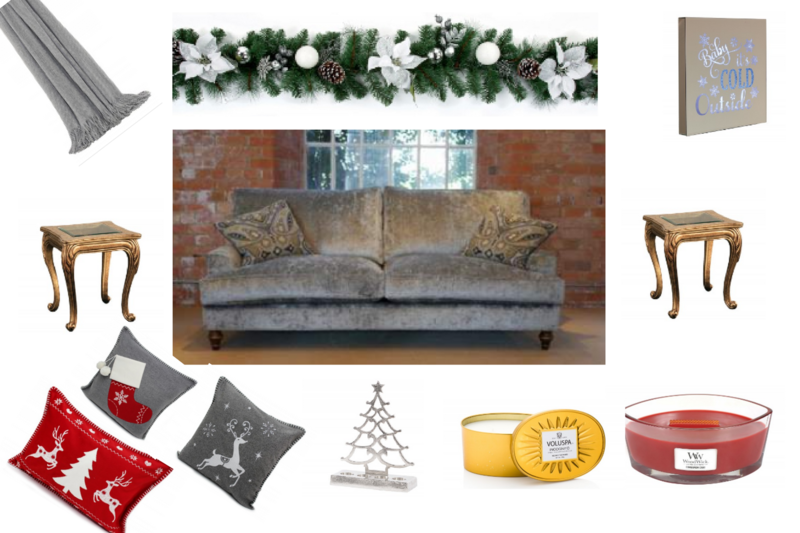 Covered in a luxurious mix of velvet and silk, the gorgeous sofa is the ultimate in comfort and a great excuse to stay in and snuggle up with your loved ones while watching old Christmas movies. No snuggle on the sofa is complete without a big blanket or throw to wrap around you. Now if you are looking for ultimate luxury then you need a cashmere blanket but if like me you have 2 small monsters who wipe their chocolate covered hands on anything then go for a washing machine friendly fleece or soft wool blend. The final pieces needed for an extra special sitting experience at Christmas is cushions and lots of them.If you don’t want to spend the extra money and waste space storing them each year just change the cushion covers for the festive season. This way it is friendly in your purse and keeps the Christmas spirit alive. Everyone always forgets about side tables. With extra guests at Christmas and the need for somewhere to put your cup full of mulled wine, each night don’t leave it too late make sure you have plenty of space. Metallic colours are going to stay big for 2018 so ornate gold or silver side tables are not only perfect for your Christmas decor they will see you ‘on trend’ for 2018. I like to swap the pictures and ornaments I have on my side tables over for the Christmas period. I replace my summery scented candles for much a much deeper fragrance like wild berries, Gingerbread and pine trees. If anything is going to make you feel like it’s Christmas it’s the smell of pine trees and gingerbread filling the house.Candles also offer a calming athmospher to a room so after a long day at work or running around town doing the Christmas shopping. The smell and glow of candles and if you are lucky a raging fire can bring some serenity back to your evening. I hope this has given you a warm, happy feeling and I have inspired you to go that extra step to create a comfy cosy Christmas. I hope that you get caught under the mistletoe with your loved one and all your Christmas dreams come true. "The Fylde Coast Women In Business Interviews – Suzie Jewsbury Bespoke Shoes and Accessories"
"Top Ten Gifts for Boys Under 10 From Wicked Uncle"